In July the City of Seattle Neighborhood Matching Fund Program approved of an 80-page grant proposal. This gives a separate committee of the Queer Youth Space known as the Three Wings $100,000 to open the safe space that many queer youths had been advocating for. Half a year later, this space still does not exist. Rapiñan explained that the funds are contingent on a physical space with a secured lease. Eden Lord, a member of the Three Wings Board of Directors, said, “What we need primarily is a space on Capitol Hill that is close to bus lines, stores and where people hang out.” The space needs to be where there’s an “alive” street. They also want to find somewhere that is accessible for the differently-abled, and somewhere where they will be able to have performances in the evenings without noise complaints. The QYS committee has had difficulty finding the perfect space and a landlord who would negotiate a lease with them. In order for them to open their cultural arts center, they will be dependent on extra help from the community. Croft added that QYS is working with Vera Project to host an all-ages queer dance party at Chop Suey on April 1st and that other fundraisers are in the beginning planning stages. “Adults say that it’s okay for (queer) youth people to come out, but they don’t have places that they can go to that aren’t directed by adults. Rapiñan, Lord, and Croft emphasized that they want their events to be accessible to all their constituents. Thus, they have had a difficult time finding spaces to hold events compared to queer-related organizations. Hosting a fundraiser in a popular 21+ Capitol Hill bar can be as simple as setting a date, time, and creating a Facebook invite list. For QYS, that isn’t possible. One of the reasons why QYS took form in the first place was because of so many fundraisers that involved pricey fancy dinners that most youth can’t afford and events in spaces that are ageist even if they could. In order for QYS to be such an avenue, the Three Wings campaign needs to find a space. After they find a space the cultural arts center, also known as the first wing, would be able to open. It would allow for events such as open-mic nights, rummage sales, concerts, and dance parties to take place. The cultural arts center of the Three Wings campaign would also like to open a café, but the square footage for the space cannot be paid for with city money. The City of Seattle Neighborhood Matching Fund Program prohibits them from using any part of the grant to make money to generate further revenue for the space. After the cultural arts center is created, the second wing, known as the Wellness Collaborative Center, would be added. “In its youngest form, it would provide mental health services to youth. It would expand to workshops focused on youth care and wellness. Also, it would help young queer people who don’t know anything about what’s out there to get the services that they need,” Croft said. The third wing, the Research and Education Center, would involve working with other organizations on the hill and getting them to be more queer youth friendly. 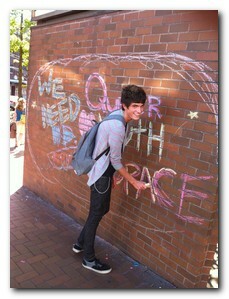 It would also be a space where queer youth can partake in anti-oppressive and activism. This training will be led by a coalition of queer leaders and educators—youth and adult alike. Members of the Three Wings campaign will be looking at a couple more locations this weekend in hopes of finding a space to set their plan in motion. Until then, the general sentiments and ambitions of the campaigns’ members stay strong. “I got involved with QYS because I felt so hopeful and inspired by this project. I feel energized and awake by being part of this. I’m inspired by the other adults and youth on this project,” Lord said smiling. After large-scale events such as the ‘Mutiny’ and ‘Pink Prom’ took place last year achieving massive amounts of publicity. A lot of people are waiting to see what will happen next with the QYS and the Three Wings campaign. Despite becoming quieter after receiving the $100,000 its members insist that 2010 was an amazing year for them. They believe 2011 will be even better.